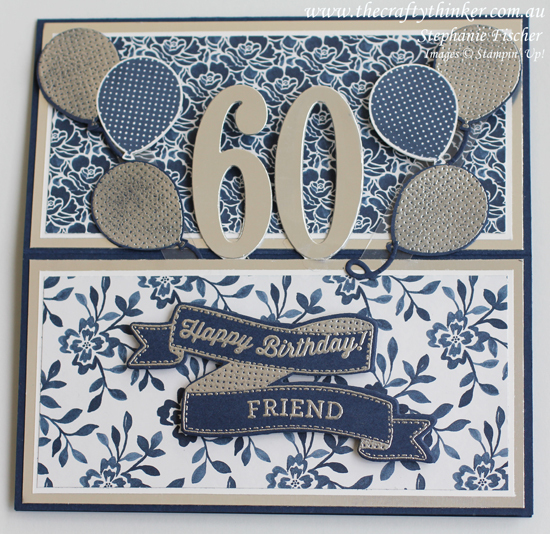 A lovely friend is having a special birthday this week - so I wanted to make a special card to match and, for special, I find it hard to go past the beautiful Floral Boutique suite! SURPRISE!! 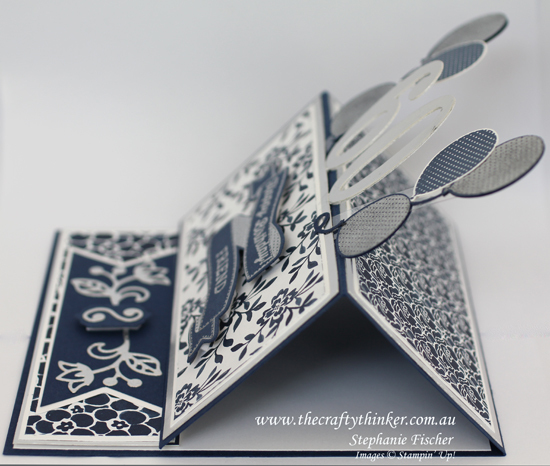 It's an easel card with pop ups! Silver Foil: 5 7/8" x 2 7/8"
Whisper White: 5 5/8" x 2 5/8"
Floral Boutique paper: 5 1/2" x 2 1/2"
Silver Foil: 5 7/8" x 2"
Whisper White: 5 5/8" x 1 7/8"
Floral Boutique paper: 5 1/2" x 1 3/4"
The numbers are cut with the Large Numbers Framelits from Silver Foil and again from Thick Whisper White. I stuck the two layers of numbers together, sandwiching some strips of Window Sheet between the layers at the bottom. 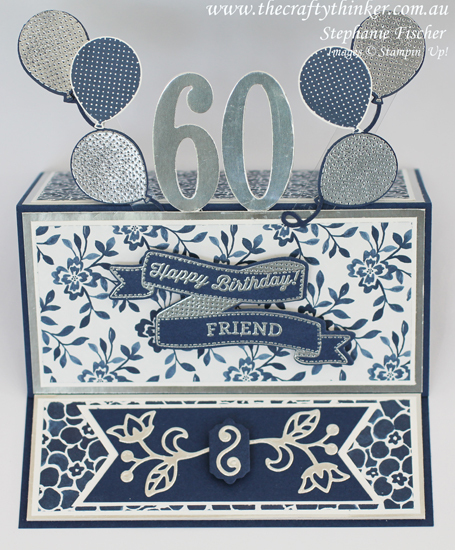 Using a balloon image from the Birthday Banners stamp set, I used Night of Navy ink to stamp onto Whisper White ink and heat embossed the same image in Silver onto Night of Navy cardstock then punched out the images with the matching Balloon Bouquet Punch. I also punched some extra balloons and made a "sandwich" with a couple of strips of Window Sheet. For the balloon strings, I used the long curly die from the Cupcake Cutout Framelits and snipped and glued pieces of it here and there. I adhered the numbers and balloon bouquets to the back of the lower panel for card front before positioning the panel. The stitched look on this banner is very appropriate for a friend who likes to sew! 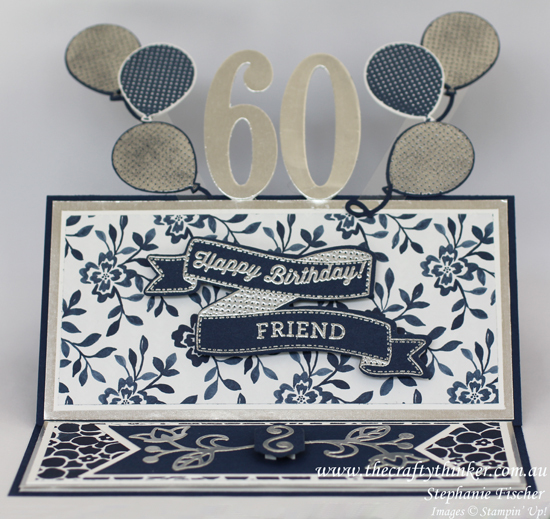 The banner and Happy Birthday greeting are both from the Birthday Banners stamp set and the word Friend is from the Bloomin Love stamp set. I adjusted the greetings on the acrylic blocks to have the same curvature as the banner. I stamped all of these in Versamark onto Night of Navy cardstock (banner first and then placing the greetings into the banner) and then heat embossed with silver before cutting out the banner with the matching Bunch of Banners Framelit. For the decoration on the easel support, I cut a piece of Night of Navy cardstock 5" x 2" and punched the ends with the Banner Triple Punch. Deciding I wanted to have a white matt for it, I cut a piece of Whisper White cardstock to 5 1/8" x 2 1/8", and carefully centred each end in the Triple Banner Punch. 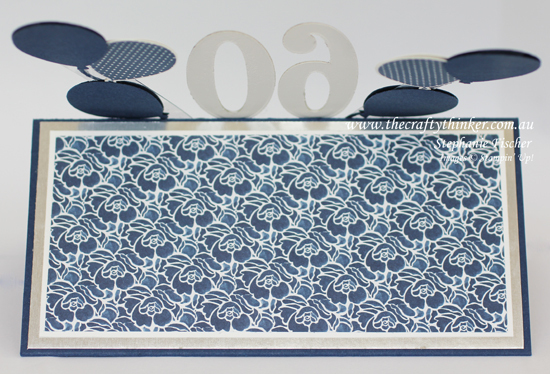 I cut two flowers in Silver Foil using the Flourish Thinlits and adhered them to the blue banner. To cover the join, I cut the smallest of the Lots of Labels in Night of Navy and adhered a Silver Foil decoration cut with a die from the Cheerful Tags Framelits set, sticking it to the centre with a dimensional.